Pakistan’s One of the Biggest Production company Nestle they are not only producing goods and foods but they have other Brands too Like NESPRESSO, PURINA, NESTLE Waters, NESTLE Health Science, CPU (Cereal Partners Worldwide Nestle and General Mills. Nestle Company is not only working in Pakistan it is the world wide Company. In the Pakistan Most of the People have a wish to join the Nestle company and Now they have a great chance to join this company for their bright future because nestle company offers higher salaries and other allowances with good facilities. 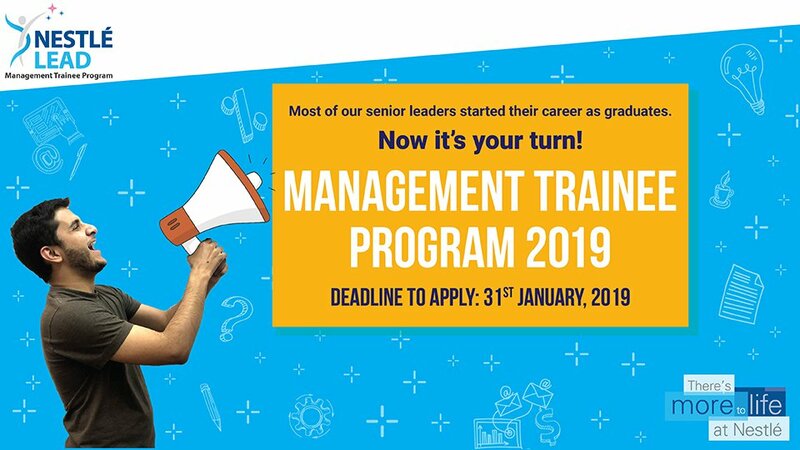 Nestle Company has announced the new trainee management program 2019 for the Pakistani Candidates to gain the experience and it is most of the chance to hire them in nestle company on permanent bases, But First they will evaluate the candidates skills and personal interest that’s why they are offering the training program. How to be part of the Career at world’s largest Food and Beverage Company NESTLE. They have more than 2000 brands and Products. NESTLE Company is working present in 189 countries around the world. Today Multiple mentoring and coaching opportunities has been announced from leaders at Nestle Company. First two years consisting of rigorous orientation program, real time business projects & functional training Diverse exposure to various functions & businesses within Nestle. If you are interested and Eligible for these career opportunity then you must apply because you have great chance you should not miss that chance. Nestle LEAD Program aims at developing youth as potential leaders with competencies and skills, through cross-functional exposure and on-job development for their career growth in Pakistan. But Questions is that Am I eligible to apply? Yes if you are Recent graduate or about to graduate in June 2019 then you can apply For These various Positions, Those will change your life and brighten your future. Note: Please keep in your mind that you will be approached only if you’d be shortlisted. When you apply for the any type of job position then First you know about the company Info that where your are applying is that company registered or not is that company repute is good or bad in Market because it is about your Future. So you can read about the Nestle company here. We are Nestlé, the largest food and beverage company. We are 328,000 people strong driven by the purpose of enhancing the quality of life and contributing to a healthier future. Nestle Company Values and Respect : Respect for ourselves, respect for others, respect for diversity and respect for our future. With more than 89.5 billion CHF in 2016, we have an expansive presence with 442 factories in more than 86 countries. We believe our people are our most important asset, so we’ll offer you a dynamic inclusive international working environment with many opportunities across different businesses, functions and geographies, working with diverse teams and cultures. Want to learn more? You must stay with us and if you have any query regarding career then you must feedback us we will help you because it is our duty to guide you.